George Edward Conroy, 87, died of natural causes Jan. 16, 2013, surrounded by his family. George is survived by his two sons, Steve and wife Kandy, of Graeagle, and Scott and wife Lorna, of Medford, Ore.; three grandchildren, Angela, April and Clint; and seven great-grandchildren, Devaughn, Destiny Sky, Austin, Sierra, Kiana, Giovanna and Bella. George was preceded in death by his wife Harriet in 2007. George was born in Bloomfield, N.J., on April 1, 1925, to George Sr. and Irene Gunhild Conroy. He graduated from Frankford High School in 1943. George met and married his wife Harriet in 1946 and they had 61 wonderful years together. 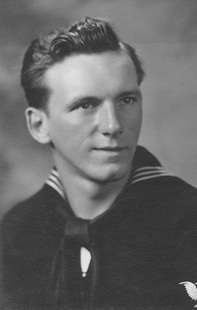 George served in the Navy in World War II from 1943 to 1949 and in the Korean War from 1950 to 1952. He was also an atomic veteran, having participated in Operation Greenhouse in 1951. 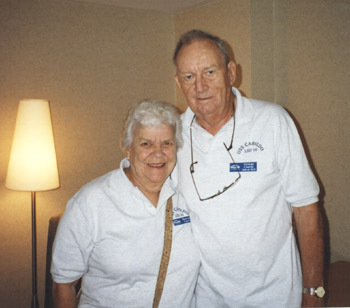 George and Harriet settled in Los Angeles where he graduated from UCLA and joined the Los Angeles Police Department in 1952. He retired from LAPD as a captain III in 1978. After retirement, George and Harriet traveled the United States and Canada in their travel trailer until they settled in Graeagle in 1984 and built a home. George loved to travel, having traveled the world with his wife Harriet, and was an avid golfer. He served as president of the Graeagle Men’s Golf Association and was a board member and treasurer for the Feather River Dixieland Jazz Society. As he wished, there will be no memorial service. George’s ashes will be buried next to Harriet’s in the Sacramento Valley VA National Cemetery. This page is maintained by Warren Gammeter Webmaster@usscabildo.org.